I read this book probably when it first came out despite having no idea who she was. Flash forward to college and studying German/Austria-Hungarian history and realizing that that's who she was! I love that this book planted a little seed that was later nurtured by my further historical studies. I love those kinds of ah-hah connections! Wonderful! Maybe the author was overly conscious of the young age of her audience? I'd imagine a lot of princess' lives wouldn't be fit material for such a young crowd. It's not all balls and princes, in real history. That's probably very true. I want to give a pass for that, but then I wonder, why add the historical note then? Why even write the book about her at all? There are plenty of other historical figures to write about. You didn't know about Sissi? 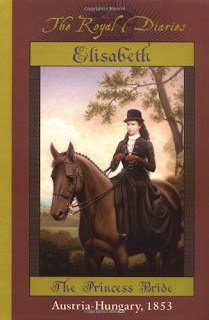 So you never saw Sissi, Sissi: Empress and Sissi: Her Destiny when you were a kid? they are these really long movies that tell her whole story (as if it were a Disney fairy tale, so they keep the evil mother in law but gloss over the rest). You must hunt them down. haha nope I had no idea! I only heard about those movies after reading this book and looking her up. I can't even find them in my library! I found a small clip of one of the movies on youtube, but the other one was... hm, why didn't I watch the other one? Maybe it wasn't in English? I don't remember now. You're re-inspired me to look for them! I used to love these Royal Diaries books when I was younger! But yeah, I would likely not be nearly so impressed with them now as they definitely seem geared towards a younger age-group. I would prefer the gritty details of the last 50 pages! Still it's a good way to learn about someone you never would have known about otherwise! The formatting sounds interesting, though it's a shame about those first 50 pages. The rest sounds awesome, though! !